Before illustrating how they are different, I will both comic books and graphic novels and show their similarities. Both using graphics, illustrations, and words to tell the story. Both can be used to tell a variety of stories, so the content of the book is not what defines the differences. Both are popular content for major motion pictures, as seen from V for Vendetta and Watchmen for graphic novels and endless Marvel movies for comics. 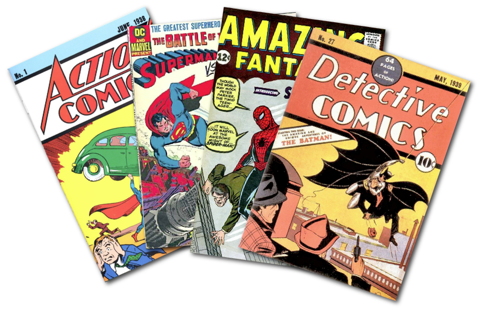 Comic books are serialized, meaning that the entire story is released in a series of multiple books. Comics are also shorter than graphic novels in a single book, but the entire story can last months or even years. Complexity is from the length a character’s storyline lasts, not from details in a single issue. Graphic novels are longer in length, and one story can be done from beginning to end in a single book, although some graphic novels are in a series. Because of the ability to do a whole story in one, graphic novels can have more complex and detailed storylines than comic books that have a storyline lasting for years. Manga is considered a form of Japanese graphic novels. Want to learn more about this? Nerdily wrote about Comics vs. Manga! Her post gives much more detail than mine if you want to learn more. Superhero Sexism: Is It A Thing? My 10 year old schooled me on this the other day when I accidentally called his comic a graphic novel. I asked him who taught him the difference and he said “You, Mommy. Sorry. But you forgot!” Cracked me up. Love manga! I read Sailor Moon all the time as a child. Thanks for clearing that up, because I honestly could not have told anyone the difference.